Early in our relationship, my husband and I didn’t have a lot going for us. We lived 1400 miles away from each other. We wanted to get married ASAP but everyone (yes, everyone) thought we were crazy. this homemade buffalo wing sauce recipe. I like to joke with my husband that, while I brought gobs and gobs of debt to our marriage, he brought the best buffalo wing sauce I’ve ever had. Still, it’s hard to argue that this buffalo wing sauce isn’t the best when you’re dipping chicken wings for extra sauce, when you’ve poured yourself a bowl on the side for even more dipping, and when you can’t help but finger-swipe the extra sauce in the bowl before you start washing dishes. This sauce has been a family secret for 12 years now, but I twisted Mr. Crumbs’ arm in order to share it with you, so you can root for your favorite sports team without sacrificing your real food goals. Friends, this buffalo wing sauce is about to change your life! 1. It beats the pants off of any store-bought buffalo wing sauce. Hands down, no doubt about it. And we have dozens of friends who have come over for homemade pizza and wing night to back us up. 2. It’s healthier than store-bought. Yep, I’m pulling THAT card on you. I’m all about the party food, people, as evidenced by eating an entire batch of vegan nacho cheese sauce BY MYSELF (while the rest of my family chowed down on easy potato skins). But I definitely don’t need to spend two days recuperating from that strange mystery dip by the chips, or those meatballs in that “swiss” sauce. No way. If I can make a healthier version myself, I’m doing it. Besides, just because we can buy something at the store, doesn’t mean we should buy it. Case in point, have you read the ingredients in a box of cake mix? Or the ingredients on a jar of mayo? It’s not a pretty sight. That’s why it’s better to make your own using my favorite homemade yellow cake mix or homemade chocolate cake mix recipe, or even homemade brownie mix recipe. You can even make your own mayo with my fail-proof recipe (that uses just FOUR ingredients, by the way). 3. You know what the ingredients are. 4. Can be made with what you already have on hand. If you like party food and you like buffalo sauce, odds are you already have what you need to make this buffalo wing sauce recipe anyway. Why bother going to the store to buy MORE THINGS when you can make it with what you already have? 5. It’s one less thing to buy. Let’s rabbit trail down real life for a minute. There have been instances when I have purchased a condiment at the store and put it in the pantry fully intending on using it for dinner that week. “Later” ends up being months later again, when I’m now tired of re-arranging the condiments on the door shelves for the hundredth time because we still haven’t finished that darn bottle of whatever condiment and yet, I have no clue what to use it for other than that one particular recipe… that uses 1.7 tablespoons. And at that rate, the bottle will be gone in roughly 14 months. 6. You can make just as much as you need. As written, this recipe makes a lot of wing sauce. We don’t mind because we like eating buffalo wings! If you prefer making wings for just one night and not having lots of sauce leftover, halve the recipe. If you’re going to be feeding a lot of people at your party (or a few big eaters), then make the recipe as-is. We like to use leftover buffalo wing sauce on one-pan buffalo chicken potatoes and buffalo chicken bacon ranch salad and drizzled on chicken jalapeno popper casserole… oh yeah, and on homemade buffalo chicken pizza. You can NEVER go wrong with buffalo chicken pizza. 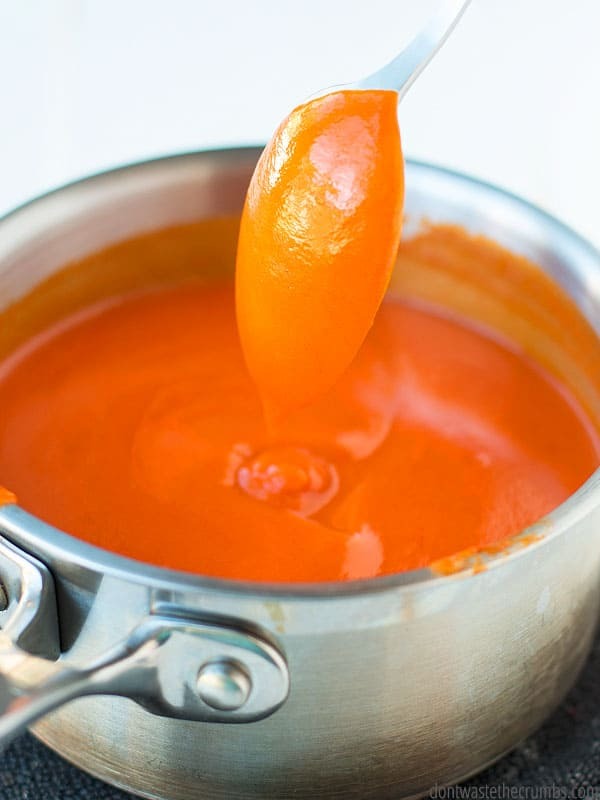 Enough about WHY you should make this buffalo wing sauce recipe. Let’s talk about the three simple ingredients you need to make it. 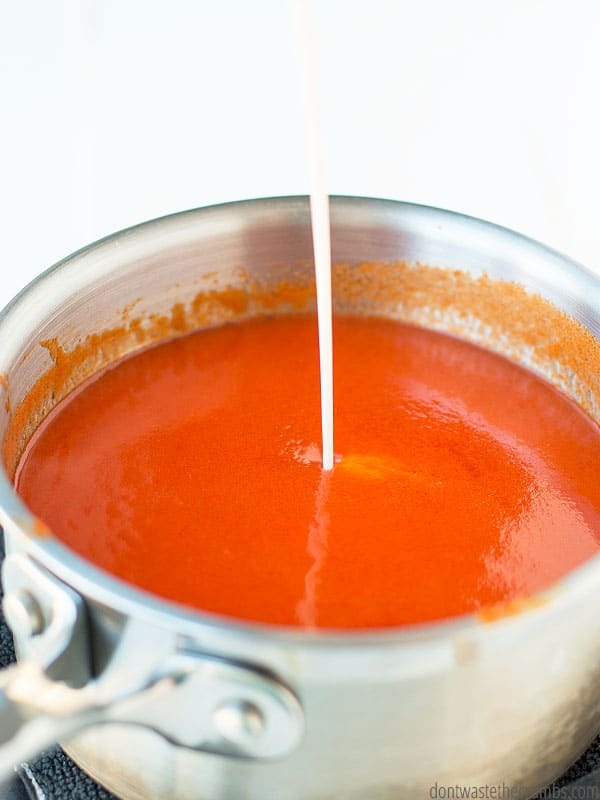 Traditionally, we’ve used Frank’s hot sauce when we make this buffalo wing sauce recipe. However, my homemade hot sauce recipe is a Frank’s copycat and if you happened to make some this past fall when you had buckets and buckets of peppers coming out of your garden, SUBSTITUTE!! You won’t be sorry. You can also use a store-brand wannabe Frank’s hot sauce, but check the ingredients first. You’re looking for peppers, vinegar, water and spices (salt and garlic powder specifically). 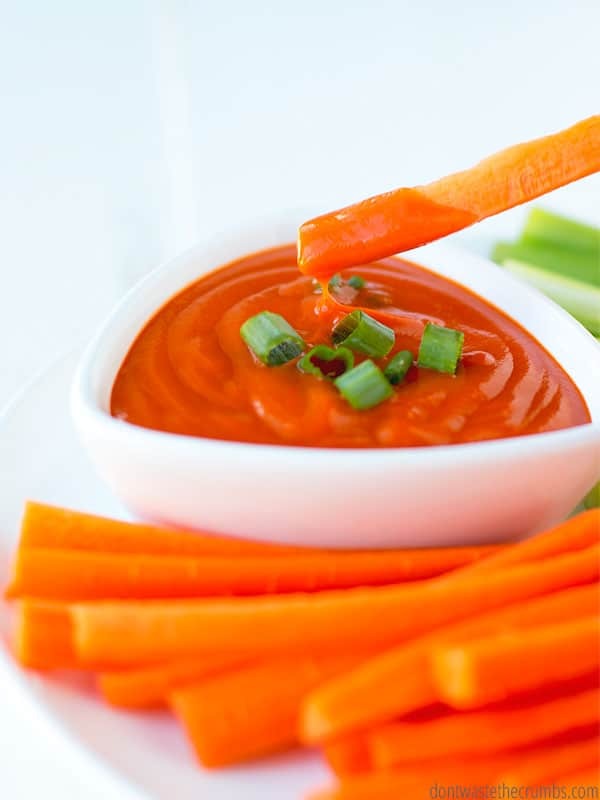 Avoid any sauce that has sugar, high fructose corn syrup or hydrogenated oils. Or that has ingredients that you don’t recognize, you can’t pronounce, or sound like a foreign language. Gross. I know. I KNOW! Ketchup in buffalo wing sauce? It’s just like when I told you about black beans in brownies and white beans in maple pecan blondies and how cashews magically become cheese sauce – don’t knock it until you try it. 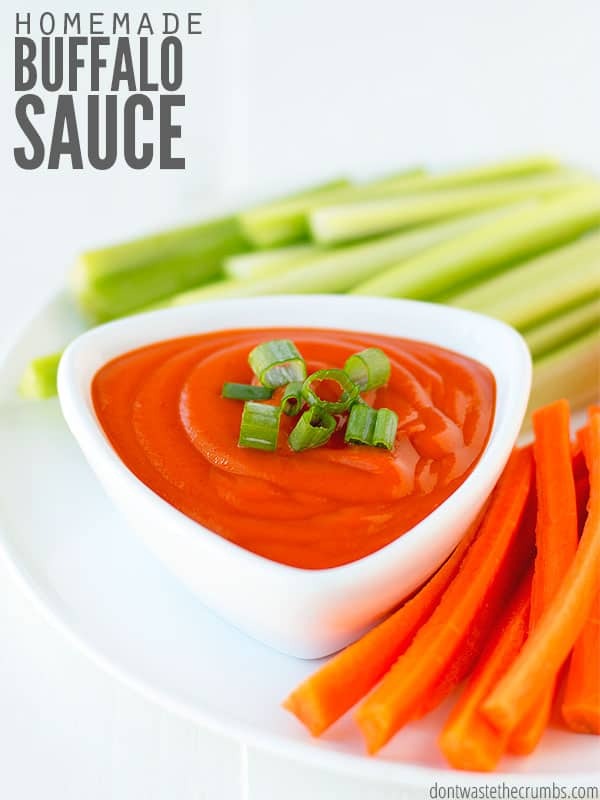 Ketchup is a known offender for having high fructose corn syrup (read why we avoid it here), so make sure you’re checking labels and not eating it. I’ve found that organic varieties don’t have it, and some mainstream brands now have a “simply” line that doesn’t include it either. You can certainly make your own ketchup too, and I have a slow cooker ketchup recipe to help you do that. But unless you have bushels of tomatoes coming out of your garden in the summer, it’s not very cost effective to make your own. Just a heads up. Unless you just want to be able to boast to your friends that you made homemade ketchup, in which case, I say GO FOR IT. 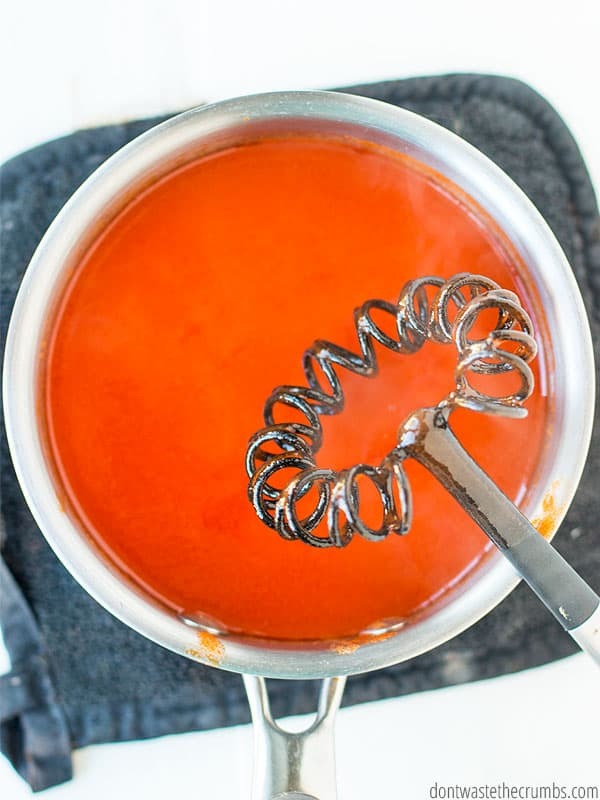 I have to tell you – when I saw my future husband put hot sauce, ketchup and butter in a saucepan, I thought he was nuts. Somehow THAT was going to turn into amazing buffalo wing sauce?! OH YES IT DOES. Because butter makes everything better. In the 12 years I’ve been making this buffalo wing sauce recipe, I’ve never once tried anything other than real butter. Not margarine… not “butter spread”… not ghee… not coconut oil. Just a heads up here – I have no idea if any of those things will work. And to be honest with you, I wouldn’t recommend experimenting. This is one of those recipes that just works, for whatever reason, and I’d hate for you to waste your precious grocery dollars on a failed experiment. BUT… if you do branch out, let me know, mkay? Because I’m sure someone out there is curious enough to give it a shot and the rest of us want to know how it turns out. Thankfully, I’ve learned to decipher his code and get a few more details so this awesome sauce can be replicated elsewhere. You’re welcome, and enjoy! Try these other tried-and-true party recipes, sure to knock the socks off your party guests while keeping your grocery budget in check! In a small sauce pan, combine all of the ingredients except the corn starch and water. 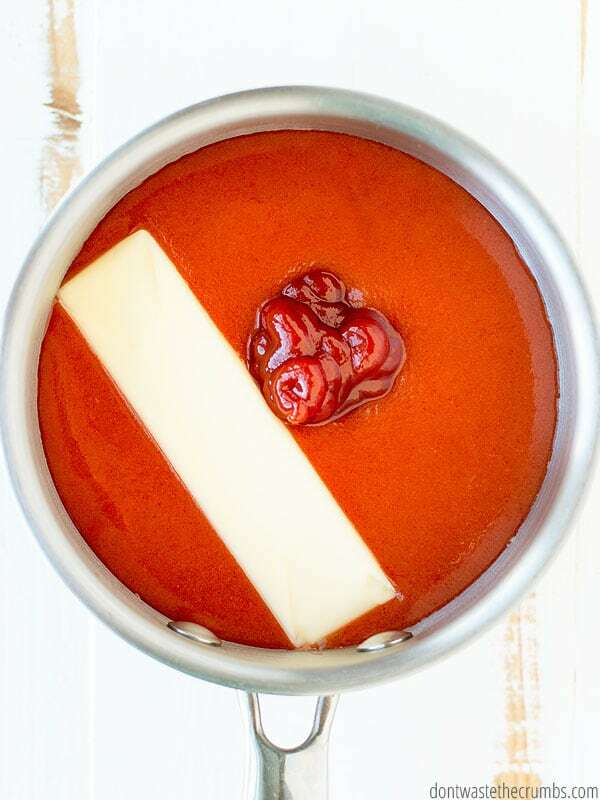 Bring the sauce to a simmer, stirring often, until the butter is melted. Combine the corn starch and water in a small mug and stir until it is completely dissolved. Pour the corn starch slurry into the sauce and immediately start whisking it into the sauce. Keep whisking, and the sauce will start to thicken. When the sauce is noticeably thicker (i.e. will heavily coat the back of a spoon), remove the sauce from the heat and set aside. Use immediately on foods that are hot (i.e. chicken wings) or let cool to room temperature to use on foods that are cold (i.e. salads). Best enjoyed the day it’s made, but leftovers will last for 3-4 days in the fridge. Is my husband the only one with secret recipes? Please tell me no… and share what amazing recipes your spouses brought into the marriage. I’d love to hear about them! This looks delicious! 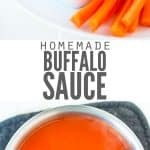 As far as substituting ghee for butter goes, I have made a “whole30” crock pot buffalo chicken recipe (it’s a favorite) and the sauce is similar to this recipe. I’ve always made it with ghee and it turns out great! So I’m sure it’d be fine in this recipe too. Thanks for the tip Katie! I’m looking for an app where I can add my stores I shop for groceries and then I add the items I prefer to shop for and it helps me find the items on sale. It’s crazy the difference in price from one day to the next. It’s totally worth visiting two or three stores if I can svae $30.00 per shopping effort. I agree – that’s well worth the savings! I don’t know if there’s an app that does everything you want, but Flipp collates the weekly ads from stores in your area and you can search the ads with your list. Maybe that would work? Check out an app called Basket. I believe it is available for iPhone and Android and I think it could be what you are looking for. Can I sub arrowroot, tapioca or potato starch for the corn starch? Some friends coming to our Super Bowl party have wheat and corn allergies. I haven’t tested those options Jackie, but I’m sure that would be fine! All food if you live somewhere where you can buy Frank’s Hot Sauce. I live in Ireland and no such product to be found. Can I use Tabasco? Sorry Tamara! I can’t possibly be knowledgeable about all the different food across the world. 🙂 I’d suggest making your own hot sauce, using the link in the post!